People really win these things! If you've followed my blog, you'll know that I have had some unfortunate luck lately between my broken hand and my mom's medical issues. 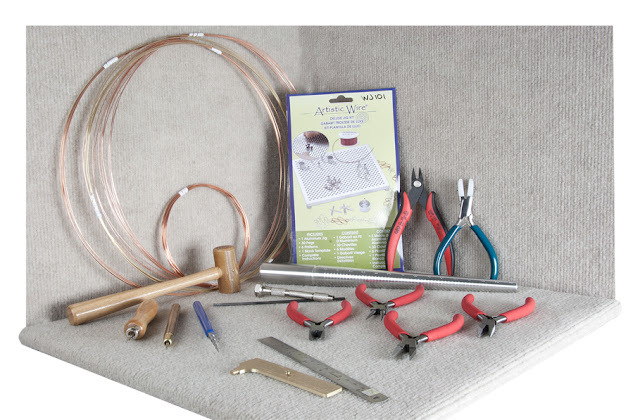 Check out Halstead, Inc. for cool supplies! My wirework experience is limited to the basics, mainly because I am always hesitant to "ruin" supplies with my inevitably clumsy first tries. So I am thrilled to be gifted this package, which I have promised myself will allow me to experiment and develop my skills. I'm sure I will share the results of my experiments, as long as I feel the world is ready for the horror! ;) If you're interested in following Halstead's Bead Blog, click on the link and maybe you can be a lucky winner of some cool supplies! ZnetShows Partner Picks Summer Challenge Reveal! Well, it's been a heck of a few weeks since I signed up for this challenge! I selected some beads to be sent to my partner, Kay of Kayzcreationz, and she sent me a very pretty grouping of beads! I knew I would be busy with the end of school, but figured once it was out, I could design my heart away...then, I broke my right hand. Yep, I'm right-handed. This is what can happen when you take on a sidewalk and gravity at the same time, kids. 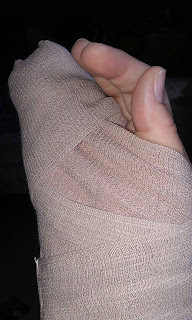 Before I even really had time to adjust to my new left-handedness, my mother had to be rushed to the hospital and was very ill for a few days with a nasty infection. She's still there, but is supposed to thankfully come home Monday--4 weeks later! So to say that I have been busy with non-jewelry matters is an understatement. While I can't do any great wire work right now, or too much knotting, I can make basic loops and strung pieces with my left hand, using my right as little as possible. Who knew? So without further delay, here are the pieces that I was able to create for the ZnetShows Challenge. I apologize for the pictures, which I had to take on the fly (like most everything these days!). 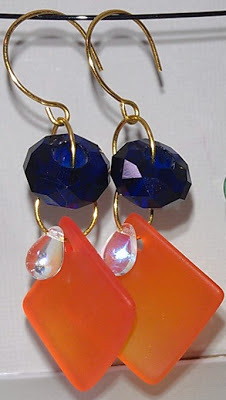 I loved the orange sea glass diamonds, and they reminded me of a blazing sunset. Since the theme is built around summer and the beach, I added the blue large hole crystals, and one of my own iridescent clear drops for sparkle. I love how these turned out! Next, I wanted to use more of the green crackle agate, which I love, love, love! 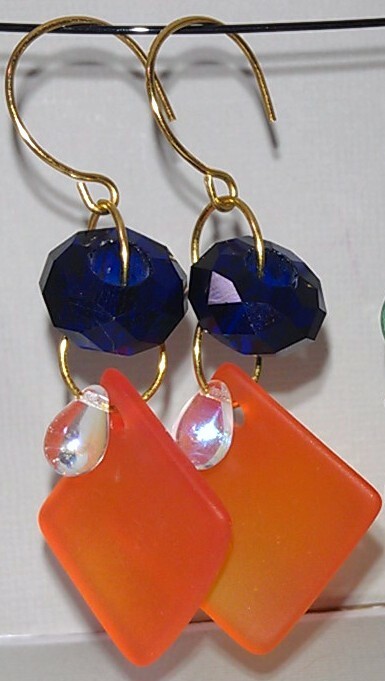 These earrings can be worn any time of year, not just for summer. My final piece, which took a bit longer than normal, is the necklace built around the focal chosen for me by my partner. When I saw it, I immediately had a vision for it, and I came pretty close! I used the pewter fish and sea-foam green pebbles to accent the focal. 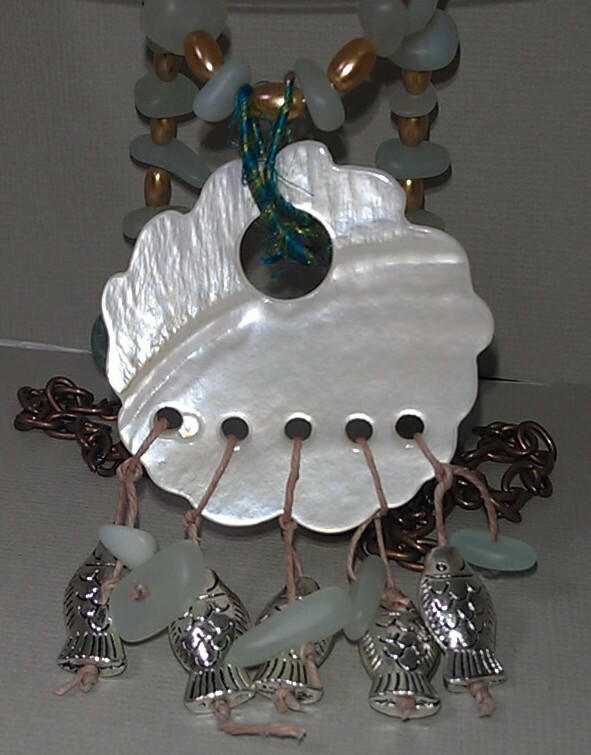 For the necklace, I paired some glass rice pearls in a sandy brown with more of the pebbles. I finished it off with some copper chain, because I wanted to keep the brown theme...but now I am wondering how it would look with silver? I'd like to invite you to see the rest of the designers' reveals on the ZnetShows blog. A special shout out goes to Hope Smithermen, of Crafty Hope, who helped to organize this swap and blog hop! Once again the generous people at ZnetShows have created another design challenge. This time we were paired up with another artist, who got to select an assortment of beads from ZnetShows stock to send to us. And since it's summertime, the theme has to do with summer and the beach. All of the designers will be holding a blog hop this Saturday, July 6th. For now here is a preview of what my partner sent to me. I was paired up with Kay from KayzKreationz. Here is what Kay chose to send to me! 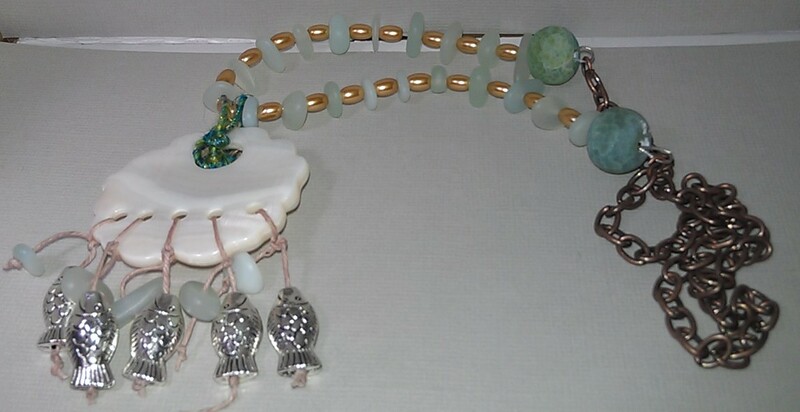 Crystal, sea glass & fishies! Make sure to stop back on July 6 to see what I create!